January 13, 2017 | By Erick A. Children martial arts classes are an excellent complement to traditional team children sports offered by schools. For a variety of reasons, your child can achieve greater physical fitness and development when the usual sports like basketball, football, or baseball are pursued in conjunction with martial arts. Parents may wonder “What is the right age to expose the young one to this ancient and timeless method of achieving fitness and discipline?” Most experts say that by the age of six a child should be ready to understand and participate competently in martial arts. If you’re not convinced of the fitness benefits inherent in this idea, keep reading. It’s fascinating to watch a children martial arts class in progress, especially if you are able to witness your own child improve his or her strength, power, balance, and coordination over weeks and months of practice. With this activity, fitness is achieved through discipline. Most people understand that the more times you repeat something, the better you get at it. 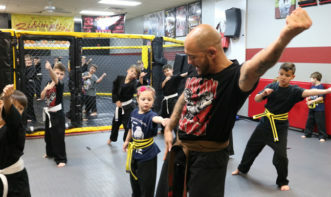 Practicing martial arts moves and routines is no different, and there aren’t many things in a child’s life that he or she will practice more times than the requirements of training for the next belt. This physical expression of “practice makes perfect” burns each single move or routine into the muscle memory, allowing subsequent repetitions to be performed with more power and fluidity as the weeks roll by. This is how discipline contributes to children’s fitness in a tangible way. Increase in the former leads to a higher level of the latter. When sparring is added to the mix, the potential level of children’s development goes up even more. It takes balance and coordination to throw oneself into the fray of a controlled battle against a peer. Even though it is a competition, there are still rules and protocols to follow and doing so requires more fitness than to simply lose one’s mind and dive into a sparring match with no self control. It’s a reality of team sports that not everyone gets to play all the time. The bigger, faster, stronger kids tend to get more playing time while others sit on the bench waiting for their chance to contribute. It’s no knock against team sports; there are valuable lessons learned completely unrelated to actual time in the game. The point is that it’s different in martial arts. Everyone participates to the fullest extent and reaps the maximum possible benefit from taking part. In team sports, the majority of the action goes to those who physically develop faster, and late bloomers are left on the bench to wait their turn. A late bloomer who gets into martial arts, though, may be able to close the gap with more skilled peers and improve his or her fitness and coordination to the point that they earn more playing time in their favorite school team sport. 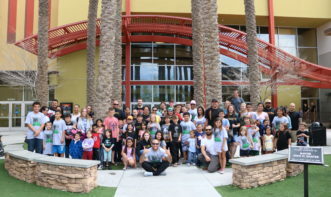 While a child might not have enough opportunity to hone their skills and coordination in team sports, a martial arts class is an entirely different beast. Participants will practice their skills daily and from the beginning of practice to the end. Though different colored belts are used to designate those who have demonstrated a higher level of skill, any child with the drive to practice can reach the next level. Childhood obesity is considered an epidemic in much of the developed world and in the United States in particular. Regardless of which martial arts style chosen, no child in the class goes without being put through his or her paces daily. Warm up calisthenics and stretching, active games, sparring, and practicing moves fill the time between the start and end of a practice session. Defeating obesity through fitness is all about movement. Children’s fitness is developed on a couple of different fronts. First, their muscles naturally develop through regular physical strain, while, at the same time, a stronger cardiovascular system can’t help but do the same. A martial arts class is an almost continuous block of activity that lasts up to an hour or longer. Even the most active of team sports (like basketball) can’t match that level of action, broken up as it is by breaks for quarters and timeouts and the shuffling in and out of substitutes. Even the best players aren’t on the floor the entire game. 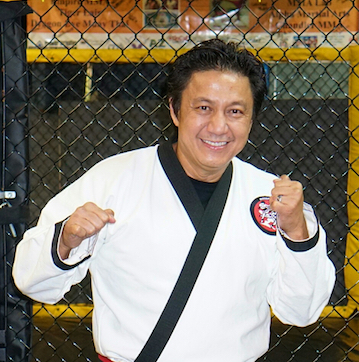 Every organized martial art spends a substantial amount of time teaching various forms of self defense. For many of the same reasons we’ve mentioned, time spent in the focused moves of learning effective tactics to take care of one’s self in a dangerous situation relies on a premium level of fitness. At the same time, there may be nothing more critical to children’s development than to learn how to stay safe and alive in the event someone tries to do them harm. In a conflict, assuming the skillets are roughly equal, who is more likely to come out on top? We’re going to crawl out on a limb here and suggest it will probably be the one with more strength and faster reflexes – in other words, a higher level of physical fitness. While this article focuses primarily on the physical fitness benefits to be gained by participating in martial arts, it’s difficult to separate out a single aspect of this sport for the sake of examination. 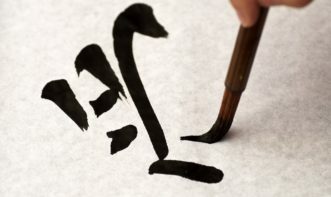 The philosophy behind any martial art is rooted in a few thousand or more years of dedication to achieving as close to perfect control over body and mind as humanly possible. As your child moves into the vicinity of five years of age, a thoughtful parent should consider exposing him or her to martial arts in addition to traditional team children sports to see if there is any natural interest.